Peter Crooks, Ph.D., D.Sc., was honored by the UAMS Winthrop P. Rockefeller Cancer Institute for his achievements in drug development. May. 25, 2018 | May 25, 2018 | The process of creating new drug therapies is completely foreign to most people. But for UAMS’ Peter Crooks, Ph.D., D.Sc., it’s just another day at the office. 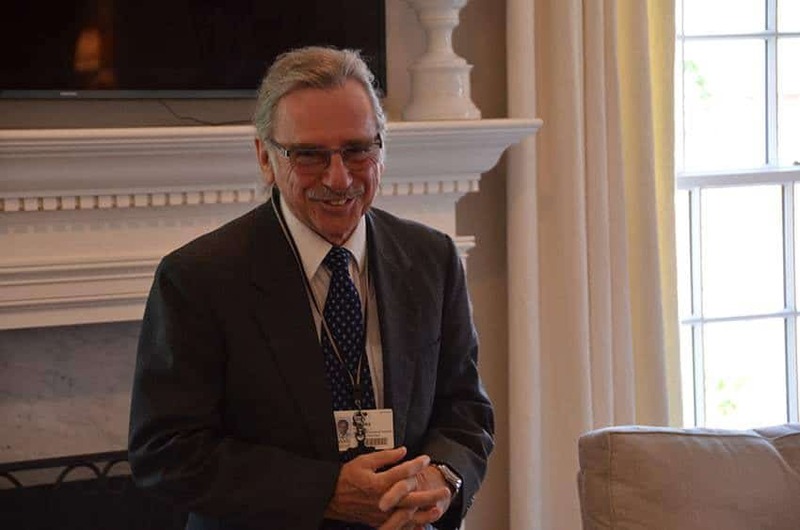 In honor of his many contributions to the field of drug discovery, Crooks was named the 2018 Distinguished Honoree by the volunteer auxiliary of the UAMS Winthrop P. Rockefeller Cancer Institute. The award was presented May 17 at a luncheon hosted at the home of auxiliary member Martha Murphy. Crooks, who serves as chairman of the Department of Pharmaceutical Sciences in the UAMS College of Pharmacy, was presented the award by Laura Hutchins, M.D., professor of medicine in the UAMS College of Medicine and associate director of clinical research at the Cancer Institute. 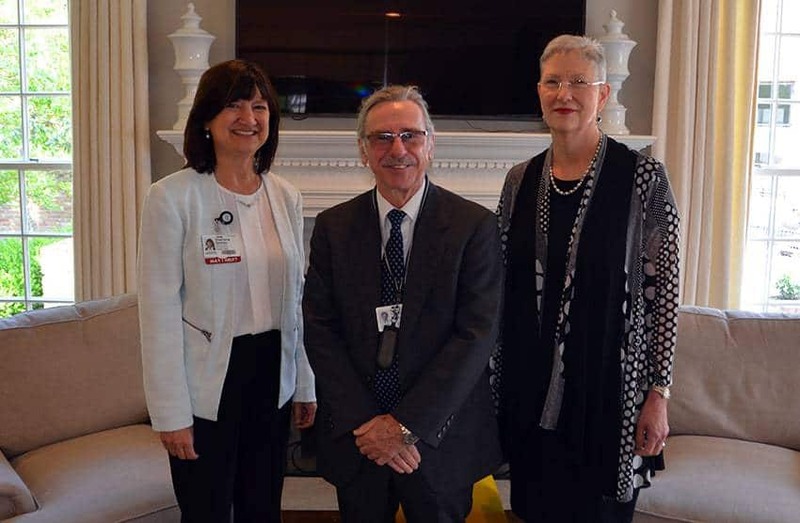 Peter Crooks, Ph.D., D.Sc., (center) is joined by Interim UAMS Chancellor Stephanie Gardner, Pharm.D., Ed.D., (left) and Laura Hutchins, M.D., prior to his introduction as the 2018 UAMS Cancer Institute Auxiliary Distinguished Honoree. “Dr. Crooks’ extensive career had led to improved therapies for patients with complex medical conditions, including cancer. We are privileged to have him and his research team at UAMS and to be witness to these extraordinary and life-changing discoveries,” Hutchins said. Among Crooks’ most significant accomplishments is the fact that five drugs discovered in his lab have made it into clinical trials, a years-long, highly regulated process in which people participate as patients or healthy volunteers to determine the safety and effectiveness of new drugs. “The stars aligned when we recruited Dr. Crooks to bring his drug development program to UAMS. Getting one new drug into clinical trials is a significant accomplishment for any scientist. Dr. Crooks has achieved this milestone five times, which truly deserves recognition and appreciation,” said Stephanie Gardner, Pharm.D., Ed.D., interim UAMS chancellor, senior vice chancellor for academic affairs and provost. His lab is now working on a development of a drug to treat neuropathy, which is the weakness, numbness and pain often experienced by people undergoing cancer treatment. “I am optimistic for the future. In the next few years, I believe you will find drugs developed at UAMS, patented by UAMS, and used clinically for UAMS patients,” said Crooks, who holds the Simmons Endowed Chair in Cancer Research. In addition to his clinical trials, Crooks also is a fellow of the U.S. National Academy of Inventors, holds more than 80 issued drug discovery patents and has 103 patent applications pending. His entrepreneurial activities have led to the founding of seven start-up drug discovery companies during the past 30 years. Crooks’ role as professor of pharmaceutical sciences also has had a significant influence on the future generation of scientists. During his career, he has mentored more than 90 graduate students and postdoctoral fellows. “Dr. Crooks creates magic in the classroom and excites students in ways that no one else can,” Gardner said. Crooks has authored more than 600 peer-reviewed research articles and 700 symposium abstracts. He serves on the editorial board of several prominent science journals, is a Fellow of the American Association of Pharmaceutical Scientists, a Fellow of the Royal Society of Chemistry and a Fellow of the Royal Pharmaceutical Society of Great Britain. The Cancer Institute Auxiliary is one of Arkansas’ largest volunteer organizations with almost 500 members dedicated to providing information, service, compassion and hope to those whose lives are touched by cancer. Each year, the auxiliary selects a faculty or staff member at the Cancer Institute to honor for his or her dedication to the institute’s mission. Janie Lowe serves as director of the UAMS Cancer Institute Department of Volunteer Services and Auxiliary. Tara Smith was the auxiliary’s 2017-2018 president.